Kevin Benjamin Kolb (/ˈkɒb/; born August 24, 1984) is a former American football quarterback. He was drafted by the Philadelphia Eagles in the second round of the 2007 NFL Draft. He has also been a member of the Arizona Cardinals and the Buffalo Bills. He played college football for the Houston Cougars. Kolb attended Stephenville High School in Stephenville, Texas, where he was a three-year starter at quarterback. He moved on to the University of Houston where he earned Conference USA Offensive Most Valuable Player of the Year honors in 2006. Kolb started for two games in place of the injured Donovan McNabb during the 2009 NFL season for the Eagles, and earned NFC Player of the Week honors following his week 3 performance against the Kansas City Chiefs. Following McNabb's trade to the Washington Redskins in April 2010, Kolb became the starting quarterback for the Eagles. However, after suffering a concussion in week 1 against the Green Bay Packers, Kolb was replaced at quarterback by Michael Vick. Vick suffered a rib cartilage injury in week four and Kolb was named the starter. 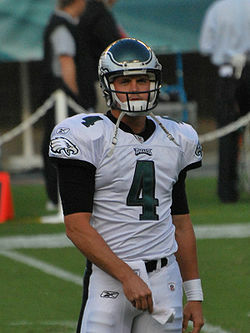 When Vick returned after week eight, Kolb was relegated to a backup role. Kolb was traded to the Arizona Cardinals prior to the start of the 2011 season. Kolb was released by the Cardinals on March 15, 2013. While attending Stephenville High School in Stephenville, Texas, Kolb became the starting quarterback for the Yellow Jackets during his sophomore year. He was a two-time UIL District 8-4A offensive MVP. His most outstanding year was his senior year, 2002, in which he completed 206 of 321 passing attempts for 3,357 yards and 29 touchdowns, as well as rushing for 197 yards. At the end of the 2002 season, he earned honorable mention All-State and second-team Academic All-State honors. Kolb initially committed to Oklahoma State to play college football but rescinded this commitment when Houston hired head coach Art Briles, a former head coach at Stephenville High School. Kolb was also recruited by TCU, Oklahoma and Texas Tech. One day before the season-opener in 2003, Kolb was named the starter in Houston as a true freshman, the first true freshman quarterback to start in the season-opener in school history, making his debut against Rice at Robertson Stadium. On September 20, Kolb threw for 321 yards and four touchdowns and went 20-for-29 passing in the 42–35 win over Mississippi State. He was named Conference USA Player of the Week for his performance. On October 25, Kolb accounted for over 400 yards passing and 100 yards rushing against TCU in a 62-55 loss to the Horned Frogs, only the fourth time this feat had been achieved in Division I-A. He tied the league record with 578 total yards, and earned Conference USA offensive co-player of the week honors for his performance. Kolb finished the season with 3,131 passing yards, 25 touchdowns, and only six interceptions en route to a 7-6 record on the year, which ended with a 54-48 loss to Hawaii in the Hawaii Bowl. Following the season, Kolb was named Conference USA Freshman of the Year. Kolb was named to the Walter Camp Award, Davey O'Brien Award and Maxwell Award watchlists prior to the start of the 2004 season. He started in all 11 games in 2004, finishing first in the conference in total offense with 256.1 yards per game, and he passed for 2,766 yards and 11 touchdowns. Kolb was named to the Maxwell Award and Davey O'Brien Award watchlists for the second straight year in 2005. After a losing season in 2004, Kolb led the Cougars to a 6-5 regular-season record in 2005. He was named the Cougars' MVP in the Fort Worth Bowl in a 42-13 loss to Kansas after passing for 214 yards and scoring one rushing touchdown. He finished the season with 3,258 passing yards, and became the school's all-time total offense leader. He earned third-team All-Conference USA honors following the season. Kolb was named to the Maxwell Award watchlist for the third consecutive year in 2006. He was named the consensus Conference USA Preseason Offensive Player of the Year, and he earned preseason all-conference honors. The 2006 season was Kolb's signature college year, in which he threw 30 touchdowns and only four interceptions on the way to a 10-4 record and a Conference USA championship. He went 22-for-35 for 235 yards and three touchdowns in a win over Rice University on September 2, and was named the Conference USA Player of the Week for his efforts. He was named as a finalist for the Johnny Unitas Golden Arm Award on November 1. He was named the Conference USA Offensive Player of the Year on November 30. Kolb won the conference's offensive MVP, but Houston lost to South Carolina 44-36 in the Liberty Bowl. He finished the season with 3,808 passing yards, 30 touchdowns and four interceptions. Kolb ended his career with 12,964 total passing yards, fifth all-time. Kolb was invited to play in the 2007 East–West Shrine Game on January 20, 2007, and the 2007 Senior Bowl on January 27. All values from 2007 NFL Scouting Combine. Kolb was rated as the sixth-best quarterback in the 2007 NFL Draft by NFLDraftScout.com, and was projected to be drafted in the third or fourth round. He hired Jeff Nalley and Vann McElroy as his agents prior to the draft, and they hired former NFL quarterback Jerry Rhome to work with Kolb to get him ready for the pre-draft workouts. He worked out with Danny Arnold in Stafford, Texas in February 2007 in order to prepare for the NFL Scouting Combine. Kolb worked out for the Baltimore Ravens in the first week of April, and followed it up with a visit to the Philadelphia Eagles. Kolb was drafted by the Philadelphia Eagles in the second round (36th overall) of the 2007 NFL Draft. He was the third quarterback taken in the draft behind JaMarcus Russell (1st overall) and Brady Quinn (22nd overall). He signed a four-year, $4.285 million contract with the team on July 25, 2007. Kolb spent 2007 as the third-string quarterback behind Donovan McNabb and A. J. Feeley. In his second year in the league, Kolb was promoted to second-string quarterback ahead of A. J. Feeley. He played the entire second half of the Eagles game against the Baltimore Ravens on November 23 after an infamous benching of McNabb. Kolb threw an interception in the endzone to Ed Reed, who took it back 108 yards for a touchdown, an NFL record. Kolb completed only 17 passes on 34 attempts for 144 yards, throwing no touchdowns and four interceptions during the season. Kolb's first NFL start was a 48-22 loss against the New Orleans Saints at home on September 20, 2009 due to an injury to Donovan McNabb. His first career touchdown was recorded in the first quarter of that game on a 71-yard pass to DeSean Jackson; he threw for 391 yards on 31 completions. On September 27, 2009, Kolb made his second start in place of McNabb, throwing for 327 yards and two touchdowns in a 34-14 win against the Kansas City Chiefs. Kolb became the first quarterback in NFL history to throw for more than 300 yards in each of his first two career starts. He was named the NFC Offensive Player of the Week after his efforts against the Chiefs. Kolb expressed his desire to be the starting quarterback for the Eagles during the 2010 offseason: "Obviously my goal is to be the starter and to start for 16 games and to lead this team as far as we can go. Personally, I don't have a lot of personal goals right now, they're more team-oriented, besides me getting on the field and proving I can take over this thing." Kolb gained many comparisons to the situation Aaron Rodgers endured backing up Brett Favre during his first three seasons. Kolb and Rodgers reached out to one another to share their similar plights. On March 26, Adam Schefter reported that the Eagles expected Kolb to be the starting quarterback for the 2010 season. On April 4, McNabb was traded to the Washington Redskins, making Kolb the starting quarterback. Kolb signed a one-year contract extension worth $12.25 million on April 29, keeping him under contract with the Eagles through the 2011 season. In the Eagles' season-opener against the Green Bay Packers, the supposed start of the "Kevin Kolb Era," he was tackled by Packers linebacker Clay Matthews, and sustained a concussion. For precautionary measures, Kolb was withdrawn from the game. After passing a series of tests, he was nonetheless withheld for the game against the Detroit Lions. On September 21, backup quarterback Michael Vick was named the starting quarterback over Kolb for the rest of the season following Vick's win over the Lions. Kolb took over for Vick in a game against the Redskins in week 4 after Vick suffered a chest injury. Kolb went 22-for-35 with 201 passing yards, one touchdown and an interception in place of Vick. However, he was still beaten by the Redskins and their new starting quarterback, Donovan McNabb, 17-12. Due to Vick's injury, Kolb started the next three games. Against the Atlanta Falcons in week 6, Kolb went 23-for-29 for 326 yards, three touchdowns and one interception, and was named the NFC Offensive Player of the Week following his performance. During the game, Kolb made an illegal horse-collar tackle on Falcons safety William Moore following an interception. The Eagles were penalized 15 yards and Kolb was later fined $5,000 by the league, the first time a quarterback was fined for a horse-collar tackle. Kolb’s final appearance with the Eagles came in the regular season finale, as the Eagles were resting many starters to be healthy for the playoffs. After the 2010 season, there was speculation that the Eagles would look to make a deal for Kolb since Vick was the clear starting quarterback. However, due to the 2011 NFL Labor Dispute, the Eagles were unable to trade away Kolb. On July 19, 2011, Kolb expressed interest in playing for the Arizona Cardinals, saying "Arizona would be a great place" to play. Kolb was traded to the Arizona Cardinals on July 28, 2011, in exchange for cornerback Dominique Rodgers-Cromartie and a second-round draft pick in the 2012 NFL Draft (which the Eagles traded for draft picks used on Vinny Curry and Brandon Boykin). Expected to start, Kolb had a decent preseason debut for the Cardinals in preseason play against the Oakland Raiders, going 4-for-7 for 68 yards; among the four completions was a 43-yard pass to wide receiver Larry Fitzgerald. Kolb started his first game for the Cardinals on September 11, 2011 against the Carolina Panthers in the first week of the 2011 NFL season. Kolb was 18 of 27 for 309 yards, two touchdowns, and no picks in the 28-21 win over the Panthers. He also posted a 130.0 passer rating in the game, third best in the NFL in Week 1. However, over the rest of the season, his play markedly deteriorated as the Cardinals lost several close games. Furthermore, he was hampered by various injuries. A foot injury (turf-toe) that he incurred in a game against the Baltimore Ravens sidelined him for several games. His backup quarterback, John Skelton, performed ably as he stepped in and won games against St. Louis (once at home, once away) and against Philadelphia. Upon return from his turf-toe injury, Kevin led the Cardinals to a comeback win against the Dallas Cowboys in overtime. The game was memorable for the blunder committed by Cowboys head coach Jason Garrett, who called a time-out to "ice" his own kicker on a potential game-winning field goal. The ensuing kick after the time-out was not good, and in overtime, Kevin threw a touch-pass to LaRod Stephens-Howling who ran it into the end-zone for the winning score. But in the very next game against the San Francisco 49ers, Kolb was inadvertently kicked in the back of the head early in the first series. He left the game with concussion-related symptoms, and did not return that season. Following a Week 1 injury to Skelton, Kolb entered the game during the 4th quarter, leading the team on a come-from-behind victory. Skelton was eventually ruled out for the Week 2 matchup against the New England Patriots. Arizona was handed their first loss of the season by the 2-2 St. Louis Rams, by a final score of 17-3. Kolb completed just around 50% of his passes, and was sacked 9 times (The 2012 Cardinals became the first team since their 2003 counterparts to allow eight or more sacks in consecutive games). Kolb proved his worth to the coaching staff following October 14's matchup against the Buffalo Bills, in which Kolb suffered a rib injury late in the fourth quarter. Skelton began taking snaps for the injured Kolb and was only able to complete 2 of 10 passes with a game-costing interception in the OT period. This injury caused Kolb to miss the following seven games, all of which the Cardinals lost. The Cardinals released Kolb on March 15, 2013 after failing to agree to a restructured contract. Kolb agreed to a two-year contract for $13 million with the Buffalo Bills on March 30, 2013. On August 24, Kolb suffered a severe concussion in a preseason game against the Washington Redskins. He was placed on injured reserve on August 30. Kolb was released on March 11, 2014. Kolb retired in 2014 due to post-concussion syndrome, citing lingering effects from three career concussions. Kolb married his wife Whitney Huddleston in February 2007. Whitney gave birth to their first child, a daughter named Kamryn June, on January 10, 2009, and their second child, a daughter named Atley Rose, was born in April 2010. Kolb majored in business entrepreneurship at the University of Houston. Kolb competed in North Texas fishing tournaments in the offseason. Kolb also enjoys hunting wild hogs in his spare time. On June 28, 2014, Kolb was arrested in Willacy County, Texas, for boating while intoxicated. ^ "Stephenville out to prove it hasn't lost a step". Amarillo.com. August 29, 2000. Archived from the original on September 7, 2012. ^ a b c d e "Kevin Kolb #4". University of Houston Athletics. Archived from the original on August 11, 2014. ^ "Big 12 South: No. 7 Texas searches for offensive identity". Amarillo Globe-News. September 23, 2006. Archived from the original on March 14, 2012. ^ a b Wizig, Jerry (September 2, 2004). "Houston hopes more translates into better on offense". Houston Chronicle. Archived from the original on October 20, 2012. ^ a b Travis, Kevin (September 30, 2003). "Pirates look for first win against Cougars". Washington Daily News. Archived from the original on January 18, 2005. ^ "Mississippi State 35, Houston 42". ESPN.com. September 20, 2003. Archived from the original on November 5, 2012. ^ Biertempfel, Rob (October 30, 2003). "Notebook: Gailey deserves credit for Yellow Jackets' turnaround". Tribune-Review. Archived from the original on October 14, 2015. ^ Anderson, Joel (August 17, 2004). "2004 PREVIEW: HOUSTON". The Victoria Advocate. Retrieved September 17, 2010. ^ "LB Davis named defensive player of year". ESPN.com. December 4, 2003. Archived from the original on November 5, 2012. ^ "DeAngelo Williams Named to Walter Camp Watch List :: Tiger running back joins Houston's Kevin Kolb on prestigious watch list". CSTV. August 19, 2004. Archived from the original on April 2, 2015. ^ "Doak Walker Award Tabs Cougars' Evans". CSTV. August 31, 2004. Archived from the original on September 12, 2012. ^ "Ducks fly south for opener". The News-Review. August 31, 2005. Archived from the original on March 9, 2012. ^ "UAB's Hackney Tabbed To Preseason Watch List For 2005 Maxwell Award". CSTV. June 22, 2005. Archived from the original on September 12, 2012. ^ Murphy, Michael (August 26, 2005). "Watch lists give UH the eye". Houston Chronicle. Archived from the original on October 24, 2012. ^ a b "League Coaches Select Kolb As Preseason Player of the Year". CSTV. July 24, 2006. Archived from the original on September 14, 2012. ^ "Lineman Rogers Named to Outland Watch List". CSTV. June 19, 2006. Archived from the original on September 14, 2012. ^ "Cougars win CUSA title". The Victoria Advocate. December 2, 2006. Retrieved October 15, 2015. ^ Woodrum, Woody (September 5, 2006). "Conference USA Coach's Call For Tuesday". Scout.com. Archived from the original on October 15, 2015. ^ Reynolds, Jeff (November 1, 2006). "Beck Named Finalist for Unitas Golden Arm Award". BYU Athletics. Archived from the original on April 5, 2011. ^ Woodrum, Woody (November 30, 2006). "MU's Albert McClellan C-USA Defensive POY". Scout.com. Archived from the original on October 15, 2015. ^ a b McClain, John (January 2, 2007). "Kolb takes first steps on road to draft". Houston Chronicle. Archived from the original on October 24, 2012. ^ a b Patton, Steve (April 29, 2007). "Eagles pass on their needs?". Reading Eagle. Retrieved September 18, 2010. ^ Murphy, John (January 22, 2007). "East-West Shrine report". Yahoo! Sports. Retrieved September 18, 2010. ^ Zenor, John (January 27, 2007). "Leak, Smith square off again in Senior Bowl". The Gadsden Times. Retrieved September 18, 2010. ^ "Kevin Kolb". sports-reference.com. Sports Reference LLC. Retrieved September 10, 2016. ^ a b "Kevin Kolb, DS #6 QB, Houston". nfldraftscout.com. Archived from the original on October 15, 2015. ^ McClain, John (February 11, 2007). "NFL NOTEBOOK: Will it be all Jake in Houston?". Houston Chronicle. Archived from the original on October 24, 2012. ^ Wilson, Aaron (March 27, 2007). "Ravens on MNF, get four comp picks". Scout.com. Archived from the original on October 15, 2015. ^ "Eagles sign QB Kolb to four-year deal". ESPN.com. July 25, 2007. Archived from the original on November 5, 2012. ^ Pasquarelli, Len (August 2, 2007). "Eagles sure that Kolb can shed 'systems QB' label". ESPN.com. Archived from the original on September 2, 2013. ^ Patton, Steve (January 2, 2008). "Eagles' Kolb continues to wait in wings". Reading Eagle. Retrieved September 18, 2010. ^ Patton, Steve (September 4, 2008). "Eagles will go as far as McNabb can carry them". Reading Eagle. Retrieved September 18, 2010. ^ "Reid benches McNabb in second half vs. Ravens, starts Kolb at QB". ESPN.com. November 23, 2008. Archived from the original on November 5, 2012. ^ Patton, Steve (November 24, 2008). "Interception spoils job by Kolb". Reading Eagle. Archived from the original on September 5, 2013. ^ "Kevin Kolb Stats". ESPN.com. Archived from the original on July 6, 2015. ^ Battista, Judy (September 21, 2009). "Eagles' Reliance on Wildcat Signals Uneasiness With Kolb". New York Times. Retrieved September 18, 2010. ^ McLane, Jeff (September 30, 2009). "Honors for Kolb and Jackson". The Philadelphia Inquirer. Archived from the original on October 19, 2012. ^ Tadych, Frank (March 16, 2010). "Kolb: Ready to prove 'I can take over this thing'". NFL.com. Archived from the original on September 6, 2015. ^ Domowitch, Paul (September 7, 2010). "Packers quarterback Rodgers can relate to what Eagles' Kolb is facing". Philly.com. Archived from the original on October 19, 2012. ^ "Kevin Kolb expected to be Eagles' starter". Rotoworld.com. March 26, 2010. ^ "McNabb headed to Washington". ESPN.com. April 4, 2010. Archived from the original on August 12, 2015. ^ "Kolb gets one-year extension". ESPN.com. April 29, 2010. Archived from the original on September 5, 2015. ^ "Kevin Kolb (concussion) not ruled out". ESPN.com. September 14, 2010. Archived from the original on December 24, 2013. ^ Davis, Nate (September 17, 2010). "It's official: Eagles QB Kevin Kolb ruled out with concussion Michael Vick to start". USA Today. Archived from the original on October 3, 2012. ^ "Michael Vick gets starting nod in Philly". ESPN.com. September 22, 2010. Archived from the original on October 4, 2014. ^ "Michael Vick to have MRI on chest, ribs". ESPN.com. October 3, 2010. Archived from the original on December 24, 2013. ^ "Kevin Kolb to start vs. Titans". espn.com. October 22, 2010. Retrieved November 22, 2017. ^ Smith, Michael David (October 20, 2010). "Kevin Kolb named NFC offensive player of the week". profootballtalk.com. Archived from the original on October 23, 2010. ^ "NFL fines Eagles' Kolb $5,000". Washington Post. October 22, 2010. Retrieved October 22, 2010. ^ "McGee leads Cowboys to late win over Eagles". The Associated Press. theoaklandpress.com. January 2, 2011. Retrieved February 17, 2018. ^ "Schefter: Three Teams Debating Kevin Kolb Deal". Bleeding Green Nation. March 7, 2011. Archived from the original on September 6, 2013. ^ Davis, Nate (July 19, 2011). "Kolb on Cardinals: 'I've obviously envisioned myself there'". usatoday.com. Archived from the original on October 11, 2012. ^ "Eagles deal Kolb to Cardinals for CB Rodgers-Cromartie, a pick". NFL.com. July 28, 2011. Archived from the original on March 29, 2014. ^ McLane, Jeff (September 19, 2012). "Cardinals' Kevin Kolb gets shot against Eagles". Philly.com. Archived from the original on October 19, 2012. ^ Sando, Mike (March 15, 2013). "Kevin Kolb's release no shock, but big deal". ESPN. Archived from the original on April 20, 2014. ^ Sessler, Marc (March 30, 2013). "Kevin Kolb agreed to a verbal contract with Buffalo Bills". NFL.com. Archived from the original on January 22, 2015. ^ Florio, Mike (April 9, 2013). "Kolb deal "screams backup"". Pro Football Talk. Archived from the original on October 2, 2015. ^ Rosenthal, Gregg (August 30, 2013). "Kevin Kolb placed on Buffalo Bills' injured reserve". National Football League. Archived from the original on September 13, 2015. ^ Rodak, Mike. "Bills release QB Kevin Kolb". ESPN.com. Archived from the original on January 22, 2015. ^ Kolb, Kevin (October 23, 2014). "Kevin Kolb Battles the Storms, Outside and In". MMQB. Archived from the original on August 28, 2015. ^ Schwab, Frank (October 23, 2014). "Retired Kevin Kolb has concussion symptoms 'every second of every day'". Yahoo! Sports. Archived from the original on October 26, 2014. ^ "Eagles QB Kevin Kolb Welcomes Daughter Kamryn". Celebrity Baby Blog. January 13, 2009. Archived from the original on February 11, 2010. ^ Wulf, Bo (April 29, 2010). "Grateful Kolb Ready To Lead". Philadelphia Eagles. Archived from the original on May 1, 2010. ^ Klump, Michelle. "FORMER UH QUARTERBACK UP FOR THE CHALLENGE -- A STARTING ROLE IN THE NFL". University of Houston. Archived from the original on January 7, 2015. ^ "Philadelphia Eagles: Kevin Kolb". Philadelphia Eagles. 2011. Archived from the original on September 7, 2011. ^ "Kevin Kolb: Hog Killer". The700level.com. May 8, 2007. Archived from the original on March 28, 2010. ^ "Kevin Kolb Arrested in Willacy County". 956sports.com. June 30, 2014. Archived from the original on December 20, 2014. Wikimedia Commons has media related to Kevin Kolb.